Someone already made a Star Fox for the Xbox One. Someone made a Flappy Bird. Someone recreated the first area of the first Fable. And, yes, a whole bunch of people have re-made Super Mario Bros. 1-1. They're doing this all in a thing called Project Spark that we've told you about a bit, but still seems to be far under the radar. Project Spark is a game-creating program that's been in beta on Windows 8.1 since late last year and just went into open beta on the Xbox One yesterday. It's eventually going to be released for real, though there's no firm date on that. It'll be coming out on Xbox 360, too. At first, it'll probably mostly be for people who dream of making games and eventually for more and more people who want to play what those people have made. We've not tried it ourselves yet, but the pitch is that it makes things simple enough: to modify terrain, to program the "brains" of characters, to establish game rules, to create a first-person shooter or a third-person adventure or a top-down puzzle game...you name it. Think of some variation of Minecraft or Disney Infinity, but with more programming potential. As you can see, a lot of what people have made in the game is based on existing games and pop culture. The developers believe that's a starting point, that people learn by re-making what they know and then will build their own things after that. They showed me the pinball game that you can see in the trailer. It was crafted Spark's starter set of fantasy-themed graphics. But Project Spark doesn't come with a how-to-make-a-pinball-game playbook, they told me. The amateur creator figured it all out. They showed me a sidescroller that was all about wall-jumping and they let me try a brain-teaser game about trying to get to squares in a maze to collide. We've seen game-creation programs on consoles before. Microsoft's Kodu was a simple graphical coding system on the Xbox 360 that was designed to help kids learn to program. Sony's LittleBigPlanet PlayStation 3 games offered creation tools. 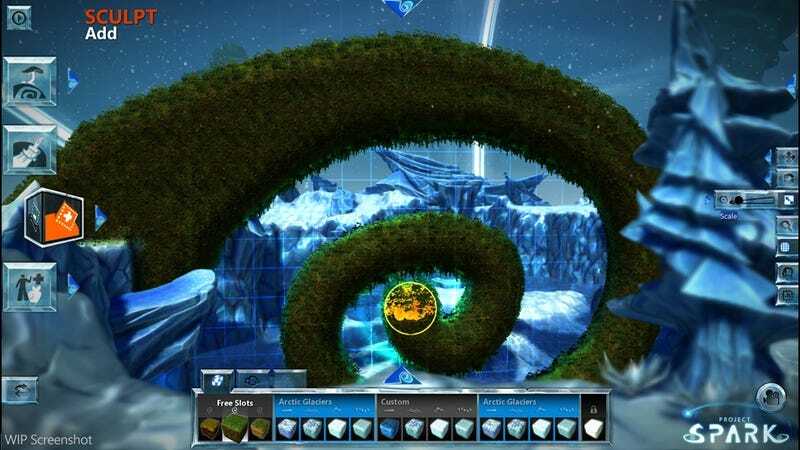 Project Spark offers more graphical flair and potential gameplay depth than Kodu but presents far less professionally-made game content than LBP. Team Dakota is making tools and assets. They're letting users make the actual gaming content. The business model behind all of this is unusual. Project Spark is and will be free-to-create/free-to-play, but the developers will create downloadable content packs—new graphics sets, for example—that players can buy with in-game currency or with real money. If a Project Spark player wants to play a creation that contains parts they don't own, they can play for free for about half an hour and then pay for more time with the game (a one day pass, for example), or pay for stuff they don't have and then play that game forever. While the quality of Project Spark will depend on the player-creators, a lot of it will also be in the hands of the developers who intend to keep rolling out new features. There may, in fact, be some parallel developments. Players, for example, have been cooking up ways to have an inventory system in the games they create. Team Dakota is working on rolling out a feature that lets players connect levels they create, allowing for bigger games (at the start, players' games are limited to what they can fit, within reason, into a 5 x 5 x 1 kilometer space). Players have been able to remix the graphics sets made by Team Dakota in order to establish, say, a set of cool-looking buildings for others to use in their games. Team Dakota is working on a genealogical crediting system that will let everyone get recognition for the parts of a game they create. They're also working on enabling multiplayer. All the games are for solo play for now. The coolest stuff I've seen in Project Spark involves motion-capture and artificial intelligence. Players get to go under the hood with both, doing their own motion and voice capture via an Xbox One Kinect sensor and creating complex strings of computer-controlled behavior with Spark's "brain" editor. In showcasing the former, a Dakota developer danced in front of a Kinect for me and then showed me how that dance was grafted onto one of the bipedal characters available for game creators. In showing me the latter, he ripped open a one-against-many combat sequence in a Spark game and showed me the dozens of lines of instructions that told the enemy characters when to approach, circle, defend, attack, etc. To a professional game developer this will all seem crude; to an amateur, this is more complex than anything else on consoles. If you're interested in getting into the Beta, sign up here. They're going to be letting lots of people in. Let me know if you find cool stuff!